The twenty fourth James Bond film may be one of the most expensive films ever made. Anticipation of the new addition is an unfortunate example of how high expectations can be a let down with a fizzle. The last Bond movie, Skyfall was a critical success and left the audience satisfied. It was beautifully photographed and the story brought more depth and insight into the 007 universe. So it's a bit disappointing that the follow up doesn't measure up. Directed by Sam Mendes who did Skyfall, it was written by John Logan, Neal Purvis, Robert Wade and Jez Butterworth. It follows shortly after the events in the last movie with the destruction of the M16 building and a new “M” in charge. In a typical Bond opening sequence finds 007 on a mission in Mexico City during the Day of the Dead festivities. There is mayhem involving a battle on a helicopter buzzing over the massive crowds running for cover. Bond (Daniel Craig) steals Marco Sciarra's octopus ring in the process and thwarting a plan to bomb an arena. Meanwhile the new M (Ralph Fiennes) has to contend with the merger of M15 and M16. The smarmy head of the Joint Intelligence Service is Max Denbigh with the code name of “C”. He's working on a project called “Nine Eyes” which is an intelligence cooperation agreement with nine countries. Once it goes “live”, everything happening in the world will be watched. C tells M the world will be safer and the need for the license to kill agents and their covert operations will be a dinosaur. He plans to shut them down. Bond gets grief for the incident in Mexico City and is put on leave. He politely agrees but manages to recruit the help of the new Ms. Moneypenny (Naomie Harris) and the new “Q” (Ben Whishaw). Bond infiltrates the meeting of the new evil organization, Spectre. 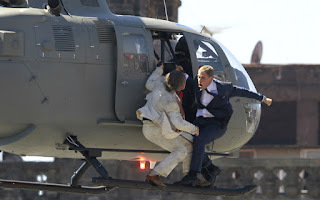 The head is Ernst Starvo Blofeld, previously known as Franz Oberhauser (Christop Waltz), a man believed to be dead. Bond's investigations are not official. Q had injected Bond with some nano technology that will help track him no matter where he is in the world. They introduce this new gadget, but it doesn't seem to do anything else in the movie. M tells him to stay in England. But Bond is on the trail of the “pale king” who has a daughter Dr. Madeleine Swann (Léa Seydoux). He gets Bond to protect her in trade of some information. Spectre bad guys are hot on their tail as their surveillance is everywhere. By now you pretty much know who is doing what with who and all that is left is for Bond to come in and make things right. Most Bond movies are full of armies of bad guys doing the bidding of some megalomaniac intend on ruling the world. Bond is also ready with all the new toys that get bigger and more ridiculous, but cool just the same. In this film the tech is at a minimum. Bond has many hand to hand combat moments and the obligatory rush to save the girl ending. Daniel Craig is dapper, efficient and very focused on his task. There are of course Bond girls that get his attention too. After all he's a hetero macho man. He does manage to utter “Bond, James Bond” and drink his favorite martini's dry not stirred. That's pretty much what one comes to expect from the franchise. Just hope the new Bond (Idris Elba cross your fingers) will reboot the formula.